We knew we had a connection with Anna the second we met her last week. She welcomed us into her apartment in New Orleans simply because we had a mutual friend. When she told us about where she is from, near Baton Rouge, we were instantly intrigued and wanted to learn more. She immediately called her parents and as soon as we knew it we headed down the bayou the following week! When we arrived on Tuesday it was as if we had known them forever. 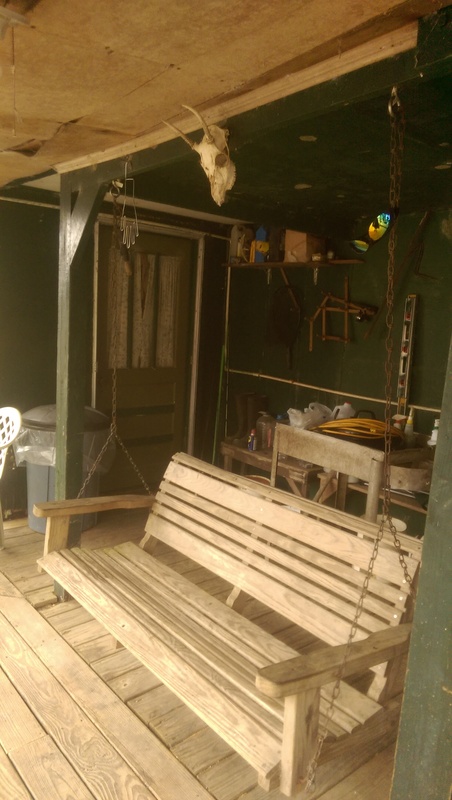 Darlene and Big John opened their home to us, so we wanted to help them out too. 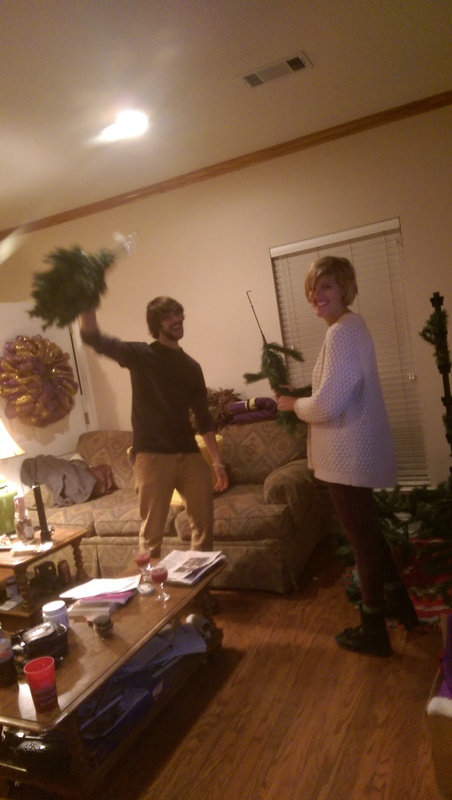 While they cooked, Mel and Nick pitched in and helped put away Christmas decorations. We had an instant connection with Darlene. Instead of going to church every Sunday when Anna was a child, her mom had them do things for others, such as stand outside of Wal-Mart and collect school supplies. Darlene had also started the first not-for-profit volunteer organization in their area. We had a lot to talk about as they cooked us a delicious fish fry. Later, they taught us how they make their own wine, banana wine, nonetheless. 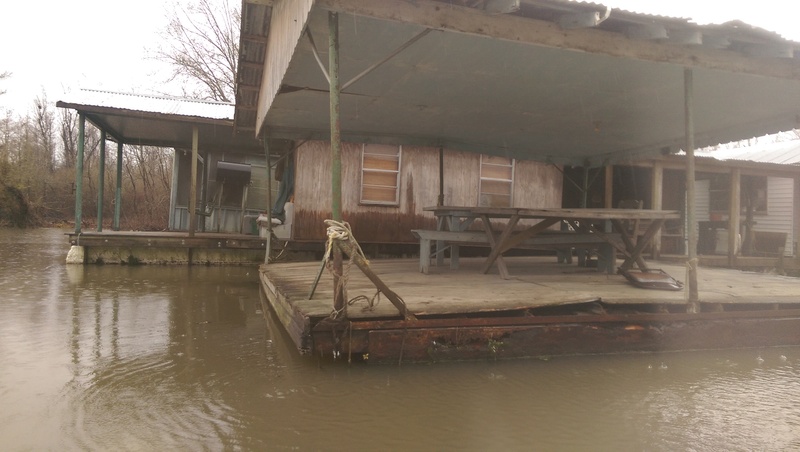 The next day, when we hopped into Scarlet to go down the bayou, we didn’t know what to expect or what we were getting ourselves into. 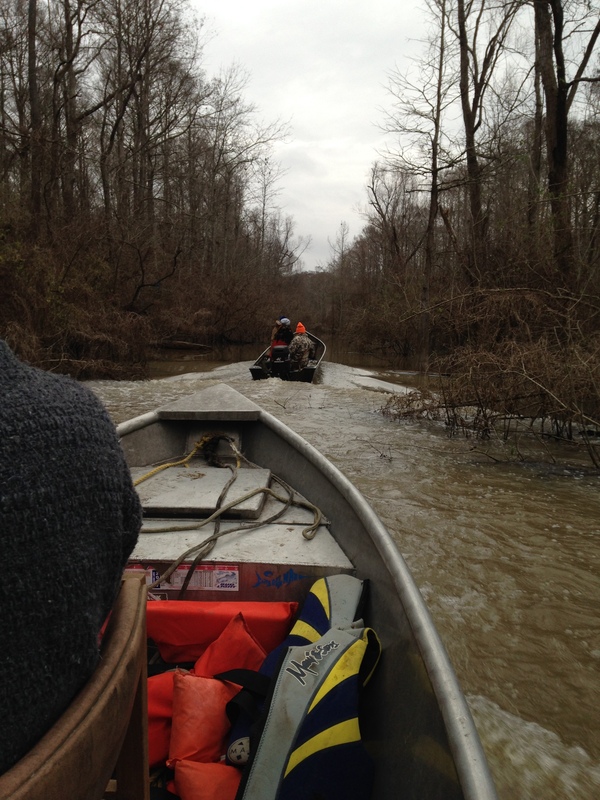 Once we arrived at the landing, we jumped into two skives for a ride that was 20 minutes deep into the swamp. It didn’t seem real when were on the boat. It was as if we were part of a video game dodging branches and brush. The swamp is murky yet beautiful in a way, lined with cypress trees and Spanish moss. Some of the old, large cypress trunks, which were unfortunately cut down years ago by Shell, looked like artwork. 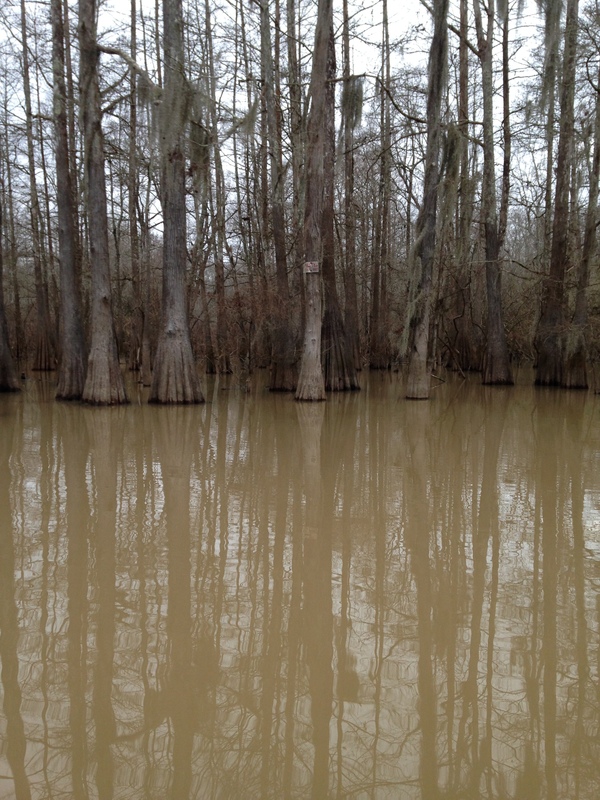 We arrived at pigeon bayou, which is a small spill off of the Mississippi. The actual spill off extends 20 miles wide at some points. There are five houseboats in their commune. The place seems haunted but is eloquently peaceful at the same time. They kindly offered to give us a tour of the area after we got settled in. The “ditches” are small passageways in between trees that are extremely narrow and shallow. This particular one led us to a hunter who was 30 feet up in a tree awaiting prey. 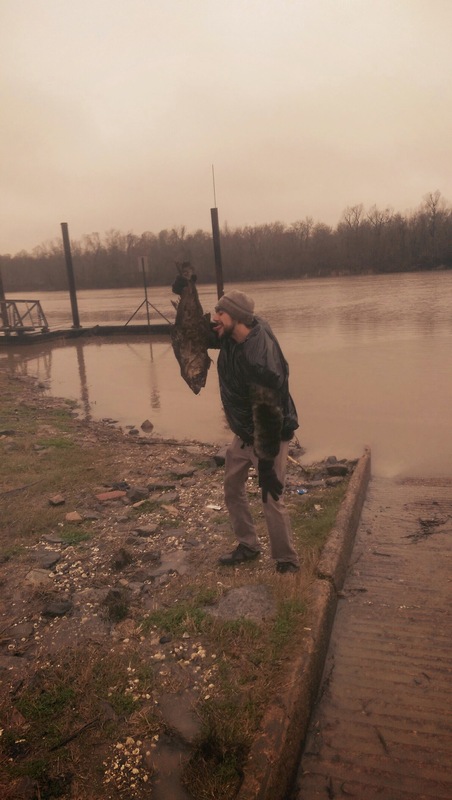 He got there by boat and then climbed with metal spikes all the way up. Most of the hunting that is done in this area is for boar, deer, and ducks. 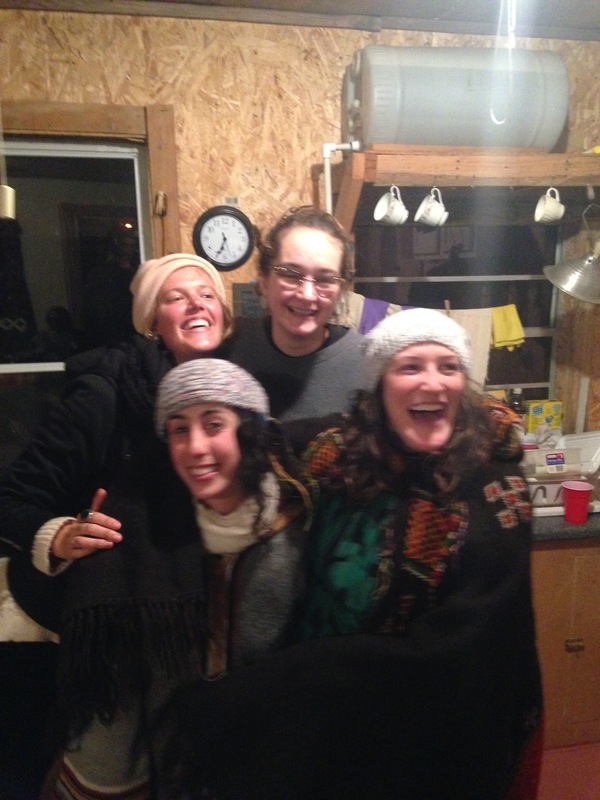 We arrive at another commune and it happens to be a kind woman, Wanda’s, birthday. We sat around and sang happy birthday while sipping homemade peach moonshine and eating cherry spice cake. 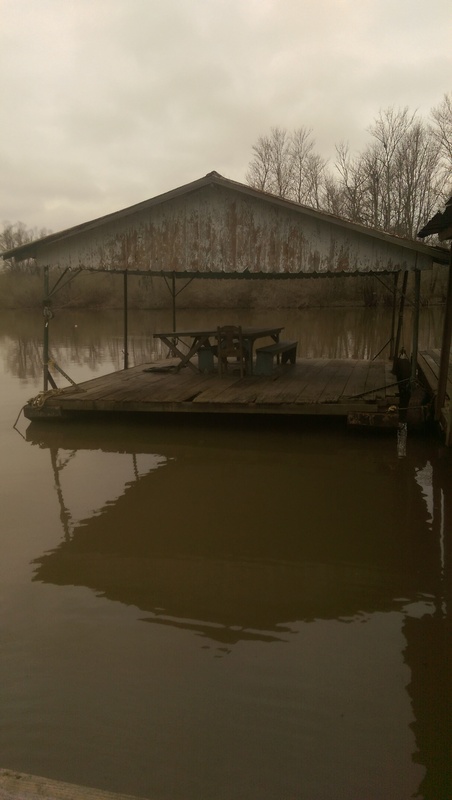 Wanda and her husband have lived on the bayou for 20 years. 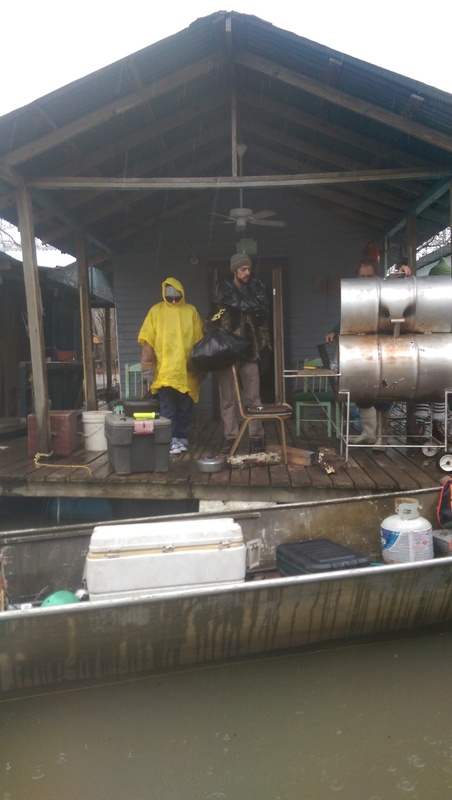 It began to rain so we packed up to go back to camp but not before hearing stories about how Shell came and placed rigs in the bayou to many peoples’ dismay. They used to get 100s of gallons of oil from the area but currently only get about 80 gallons a week. Once we got back, we started cooking shrimp etouffe and crawfish. They have one generator that provides electricity for all the boats. When you need to go to the bathroom there is a toilet seat in the back that empties out into the swamp. Our activity for the evening was shooting 22s at water bottles that were thrown into the swamp. The night came to a perfect close as we sat by the fire, listened to stories, learned the harmonica, made songs up about our experiences, and sipped whiskey (just to keep warm). Our hosts were amazing and we can’t thank them enough for this adventure of the lifetime. We can’t wait to come back again! you (2) are experiencing some AMAZING moments!! HAPPY you are “living it up” BE SAFE! !